It is with mixed feelings of happiness and sadness I am announcing this coming year, 2017, will be my last year of active teaching. After completing 22 years as a professional quilt instructor, I will retire after mid-November of 2017, making next year my "farewell tour". If you are or have been interested and considering me as a teacher for your guild/show, please contact me regarding dates in 2017. The best way to reach me is through email at vikki@vikkipignatelli.com or vikkip@juno.com. All who know me and have taken my classes know that I consider my teaching to be my mission, my calling. It's always been my intention and hope to inspire and nurture the creativity in each of my students. This is the part of teaching I will always miss. Though winding down from teaching, I will look forward to spending more time creating in my studio and intend to stay in quilting and related opportunities and pursuits. I will maintain my website. Reminiscing about the wonderful people I've met and places visited since 1995, I cherish the abundance of memories, blessings, opportunities and knowledge this calling has provided me. I am truly blessed and wish to extend my thanks to all my students years past (and future) for their support and kindness. DVD "Crazy about Curves" is available in two formats: NTSC for USA viewers and the PAL version for my overseas audience. Have you ever wished for an easy method of machine piecing intricate curves, or wanted to incorporate curved designs into a quilt but had no inkling where to begin? Hi, I'm Vikki Pignatelli. When I first began quilting, I visualized beautiful curved designs, but the traditional method of piecing curves left me frustrated. I knew there must be an easier way. After much trial and effort I did find a way. . . and now I’m crazy about curves! 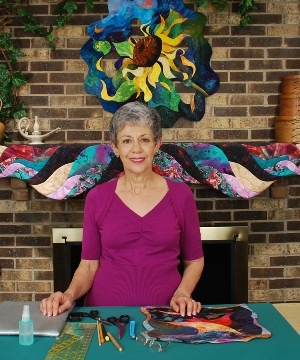 I am the founder of the Sacred Threads Quilt Exhibition. The national exhibit, held biennially, displays work from all over the United States and Canada and features themes of spirituality, inspiration, healing and grief. I was the Artist in Residence at the 2015 Sacred Threads exhibit. 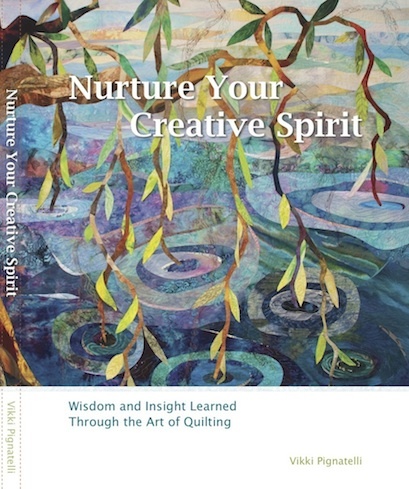 To be added to the Sacred Threads mailing list and to learn about the 2019 exhibit, please visit the website: Sacred Threads Website.